When looking to buy (or sell) a home, some of the terminology can get confusing. While it's of course your real estate agent's job to know the ins and outs of all things real estate, it's also very helpful to the Austin home buyer during the search. With all the different terms and acronyms, property listings and real estate jargon, it's hard to focus on what's important. 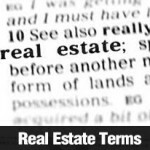 Below is a list of a few important terms you are likely to hear during your house hunt. More commonly used by sellers, this is potentially an important number for home buyers too, as it may help them quickly decipher the pace of the current market when deciding what price to offer on a home. The Sale to List Price Ratio is calculated by dividing the sale price by the listing price. For example, a $485,000 sale price divided by a $515,000 asking price equals approximately 92% - meaning the seller received 92% of their asking price. When looking at market data, the higher the average ratio or percentage, the greater likelihood that sellers hold an advantage. As of the date of this blog post, on the Eastside of Seattle, many closed sales have a 98%-104% sale to list ratio - clearly an exceptionally strong seller's market. The Median Days on Market is the midpoint of the number of days on market across a number of recently sold homes. If it's 20 days, then half of the homes sold quicker, and the other half took longer than 20 days. Most statistics will quote this based upon "active" days - not including pending days thru to closing. Others calculations may include active and pending days... so be sure to examine the data closely. The median days on market is another tool a home buyer can use in order to determine how likely it is that a seller will accept an offer at a lower price - as it stands to reason, the longer the market time, the more willing the seller may be to negotiate, than if they had only been on the market for a few days. These are both commonly misunderstood terms. Properties are listed as distressed when the owners have defaulted on their mortgage loans or are about to - but this does NOT necessarily mean that the home is actually available for purchase or actively on the market. In fact, many homes indicated as "pre-foreclosures" on websites which offer "Pre-Foreclosure" listings may not actually be for sale - nor will they ever be for sale. Instead, the homeowner has been formally notified of their past due balance, and a document has been filed with the county - known as a "Lis Pendens." In reality, the majority of these "defaults" are cured, either by the homeowner becoming current on the mortgage, or the home being sold before foreclosure proceedings begin - either traditionally, or via a short sale. When looking for "distressed" homes or "pre-foreclosures" online, be advised that you may very well be going on a wild-goose chase. Unless a buyer is willing to participate in an auction process with cash in hand, for the "average" home buyer, pre-foreclosure information can be VERY distracting. Short sales may present an opportunity for some buyers, assuming they are willing to wait up to several months for the closing - and also risk the home not qualifying for a short sale in the first place... which happens all to frequently. Many websites (including RealFX.com) display both active and pending listings, as many people like to see pending listings to know what's going on in the market. This is critical to pay attention to, so that you don't get your hopes up on that "perfect home" which actually isn't available for showings. In short, an active status means the sellers are still accepting offers, while a pending status indicates that they've already accepted an offer. it's important to note, that statuses in the MLS are not updated instantly - and many websites will have a 24-36 hour delay in reporting a change of status. So, be sure to ask your real estate agent for the most current status listed in the MLS. In the many MLS systems, there are often several "pending" statuses: Pending Inspection & Pending (the two most common, with Pending Inspection usually first) Pending Feasibility (for feasibility studies), Pending Backup (sellers who are openly accepting backup offers), and Pending Short Sale - which can last for several months.